A. In Episode 6, of Season 8, "A Little Reflection". 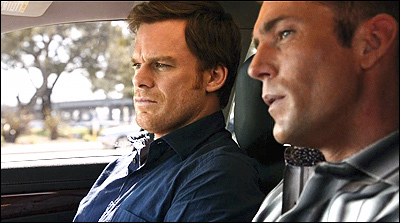 Dexter is stalking young psychopath Zach Hamilton, whom he believes killed Norma Rivera, and whom he has reason to believe may be stocking another victim. Quinn also thinks Zach is a killer, and is determined to prove it by following Zach. In this scene, Dex has talked Quinn into letting him tag along on Quinn's outing. They find Zach sitting near an outdoor yoga class in a public park, shooting photos of the women as they exercise. 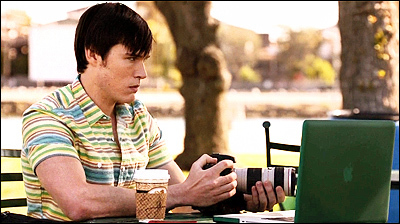 Dexter notices that Zach is focusing on one particular woman, and recognizes her from a photo he saw in Zach's photo studio. 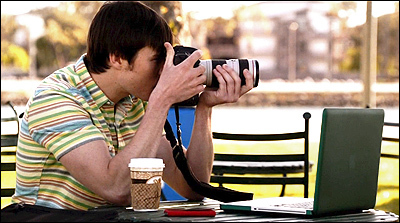 Dexter believes Zach is shooting "before" photos of this potential victim, to be followed by bloody "after" shots once he has killed her. So, when the woman returns to her car, Dex gets her license plate number. When he runs it later, he discovers she is Sofia Fuentes, who works as a waitress at Zach's father's yacht club. A. A park - just not in Miami. A. 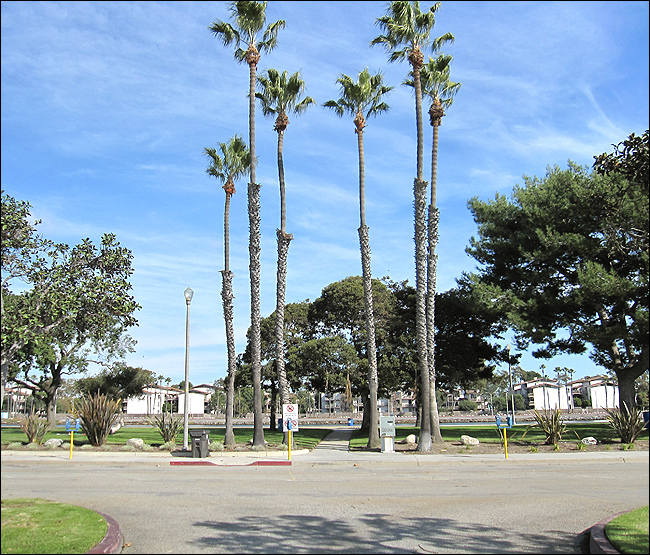 This is Marine Park at Mothers Beach, in Long Beach, CA -- a location that Dexter has used several times before. The address is 5839 E. Appian Way. It is a narrow park that runs along the northern edge of Naples Island, between the beach (on its northeast side) and a street (Appian Way) on its southwest side. It is also tucked between two bridges. On the park's northwest end is the Appian Way bridge that leads from Naples Island to the mainland. And on the park's southeast end is the larger 2nd Street bridge. On the other (west) side of the Appian Way bridge, you'll find the Long Beach Marine Stadium, where they filmed the food truck date scene with Cassie. Mothers Beach got its name because this beach doesn't face the ocean and its surf - instead, it faces the calm waters of Alamitos Bay (that surrounds Naples Island). 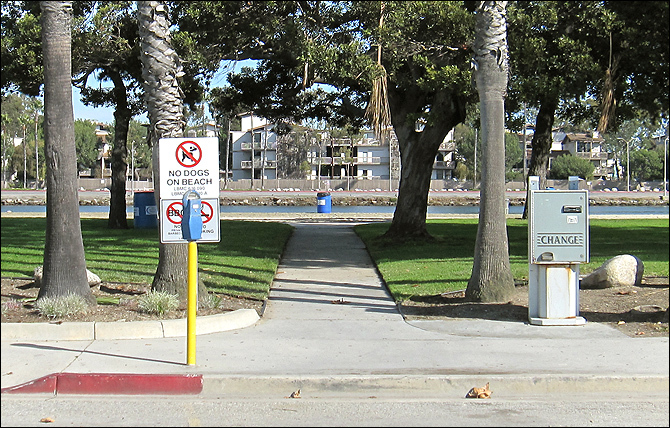 The park is also just west of the Alamitos Bay marina, where Dexter has filmed a lot over the years. The first time I encountered this park, it was way back in the first season of Dexter, when they shot a scene of Cody on a swing-set at the park. This is also the park from which Dexter abducts Estrada in the 7th season. I shot the photos below on New Years Eve 2012. A. It would be hard for me to miss this one, considering that I was just there in January, shooting the photos you see above, for that scene about Dexter abducting Estrada from the park. Plus, those bridges visible in the background are a dead giveaway.